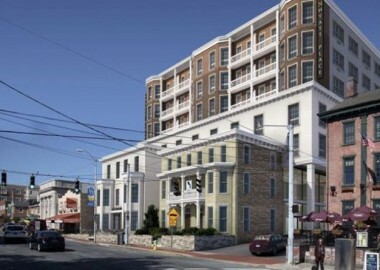 The project will generate tax dollars for the city via the new 3 percent lodging tax on hotels. The vote [to] give the Lang Development Group the go-ahead to start work on the new building that will contain 144 hotel rooms, 19,500 sf of office space, a parking garage, and a restaurant. The project also takes into consideration the protected status of the Green Mansion and has incorporated the home into the design. The office space, the hotel lobby, and the restaurant will take up the first three floors and hotel rooms will take up the remaining four floors. A swimming pool will sit atop the parking garage behind the building. Although the project would remove more than 70 parking spaces from a city parking lot, the new parking garage would include 244 parking spaces, some of which will be available to the public depending on hotel occupancy. Councilwoman Jen Wallace and Councilman Mark Morehead votes against the project. Unanimously approved in October of 2018, the new lodging tax on hotels took effect last December.